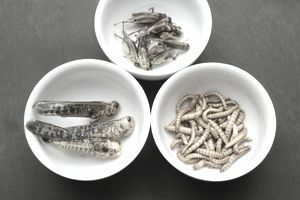 No matter how unpalatable insects might seem to you, creepy crawlies such as silkworms, caterpillars, and crickets just might be a key source of protein in your food--as well as an important sustainability idea. The notion of insects as food might make your skin crawl, but they have been eaten by people for thousands of years. Today they are actively consumed in various parts of the world. The farming of insects like crickets has taken off in many countries including Thailand, India, South Africa, and Kenya. There are various estimates pertaining to how widely they are eaten. Many proponents of entomophagy (the technical term for eating insects) claim that insects are eaten in 80 percent of countries, while the Food and Agriculture Organization (FAO) of the United Nations in a 2013 report says 20 percent of the world’s population eats insects. Let's take a closer look at the potential for insects as sustainable food alternatives. Insects are cheap, nutritious and according to some supporters, they are “delicious.” There are over 2,100 edible insect species, which offers a vast array of options for preparing food items featuring insects. FAO states that edible insects contain very high-quality protein, amino acids, vitamins, calcium, zinc, and iron for humans. When you have a healthy source of protein, minerals, and other things you're looking for in your foods, a Michelin restaurant taste experience might arguably be a secondary priority. Consider that 100 grams of beef contains 29 grams of protein, but also 21 grams of fat. On the other hand, 100 grams of grasshopper contains 20 grams of protein and only 6 grams of fat. In addition to their nutritional value, commercial insect production has a much smaller effect on the environment than more traditional sources of protein. Rearing conventional livestock accounts for a staggering 18 percent of total greenhouse gas emissions. But insect rearing releases much less greenhouse gas, methane, and ammonia than cattle and pigs, and requires less water. As mentioned above, insects have been consumed by humans for thousands of years, starting from the time of ancient hunters and gatherers. The practice continued to evolve with succeeding civilizations. The Greeks and Romans were known to dine on locusts and beetle larvae. One renowned Greek philosopher and scientist even wrote about harvesting tasty cicadas. And even in the Old Testament, St. John the Baptist describes how he survived on honey and locusts when he lived in the deep desert. The ancient Algerians ate locusts as a cheap and nutritious source of food after boiling them in salt water and drying them in the sun. The aboriginal Australians would eat foods made of moths, witchetty grubs, and honeypot ants. What Countries Eat Insects the Most? Mexico, Brazil, Ghana, Thailand, China, the Netherlands, and the United States are some of the countries where insect eating is most widely practiced. Arguably, Mexico is the country where bug consumption is most popular. You will find many Mexican delicacies such as candy-covered worms, chocolate-covered locusts, and ant eggs soaked in butter. Brazilians like to collect ants, remove wings and fry and eat them. They also like ants dipped in chocolate. To them, ants simply taste like mint. Bug-eating has had a long tradition in many parts of that country. Surprisingly, insects account for up to 60 percent of the dietary protein in a rural African diet. Termites are very popular, especially in Ghana. How about snack food? Eating crickets, grasshoppers and many varieties of worms perform this role in Thailand. Many Thailand bars serve fried bugs along with their libations. In China, fried silkworm moth larvae, and roasted bee larvae are two common items in food stalls. With the U.S. edible insect industry already registering $20 million annually in sales, there seems to be an opportunity for growth. While not yet a popular practice, many food makers are convincing America to eat bugs by educating people about the various health and environmental benefits associated with the practice. Silkworm soup and grasshopper tacos are found in some San Francisco, New York, and Washington D.C. restaurants. Recently, Exo, a cricket protein bar, raised more than $4 million from big-name investors. The major insect-based food makers like Exo, Chirap, and Chapul all note on their packaging that their products are gluten-free. Exo and Chapul even specify they their products contain no dairy or soy. Some followers of the Paleo diet in America are already eating cricket powder protein bars. For CrossFit devotees and weightlifters, protein is a priority and companies like Exo are finding support from such people. While not widespread yet, eating bugs is becoming more popular in the U.S. According to a recent study from the University of Copenhagen, insects are extremely sustainable, more so than meat as a protein source. And according to the UN, the worldwide livestock industry accounts for over 14.5 percent of global greenhouse gas emissions. By comparison, cricket production is 20 times more efficient as a protein source than cattle, and it produces 80 times less methane. Additionally, insects can thrive on organic waste, allowing farmers to cut back on growing the grain used in animal feed that requires a lot of energy and water resources. The rearing of insects requires dramatically less food than raising beef. For example, insects consume just 2 pounds of feed to produce 1 pound of meat, while cattle require 8 pounds of feed to generate 1 pound of beef, the FAO. That’s why the UN called for swapping burgers for bugs. Insect farming makes economic sense as well. As insects are cold-blooded, they require less energy to stay warm. This helps explain why they are more efficient at converting feed into protein. Consider that crickets need four times less feed than sheep, 12 times less than cattle and half as much as broiler chickens and pigs to produce the same amount of protein. While many people still are aghast at the thought of eating bugs, insects are increasingly recognized as a good protein alternative food for the future. Consider that by 2050, the world’s population is expected to reach 9 billion. The urgency for sustainable food protein alternatives such as provided by entomophagy is increasing. Sustainability, increasing demand for protein, and low feed-to-protein ratios are some of the reasons startups around the world are keen on establishing insect farming businesses. Ynsect, an insect farming company from France, has raised over $37 million in funding. AgriProtein, a startup from South Africa, has put together $30 million in funding so far. But the industry is not without its share of challenges. The dislike, disgust or fear of much of the populace towards the eating of insects will require a major shift in public perception. Given the resistance in the marketplace, a potential entrepreneur must deal with operational aspects of starting a bug production operation as well as trying to educate consumers about the benefits of insect-based food and convincing them to try it. While eating insects is a sustainable protein source for the future, it will take time to develop a culture where people will feel as comfortable eating insects as dining on other foods. Maybe large-scale production and mass acceptance of insect-eating in other parts of the world, or by some groups in the U.S., can help insect-based food to become gradually accepted as an everyday protein source for the masses. There will be not only great interest but also an urgency to see how the new insect farming companies perform over the next couple of decades. Perhaps there will be a point of convergence where a growing and increasingly sophisticated industry and a gradually transforming consumer palette will meet.